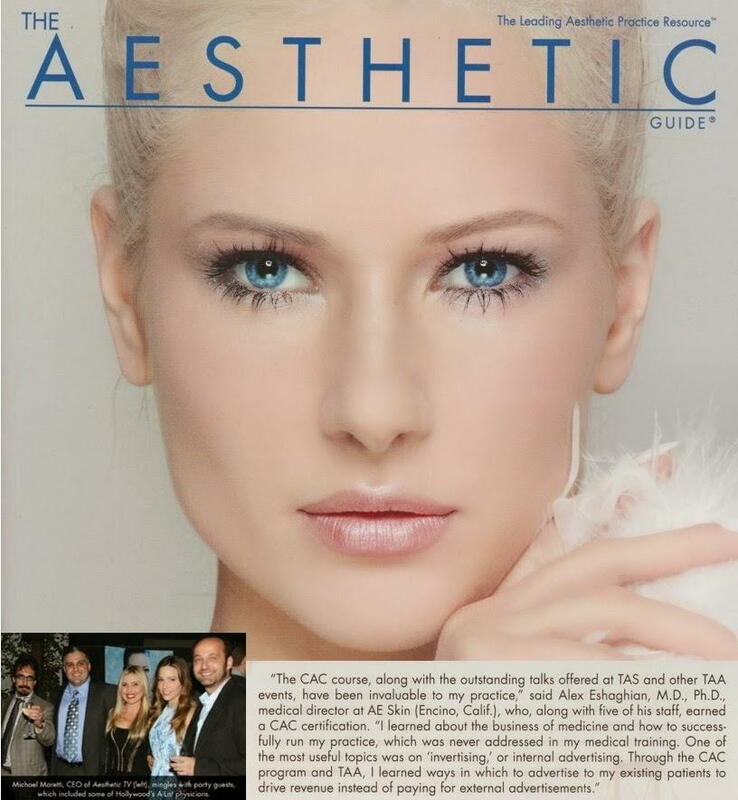 A E Skin is featured in the July/August 2014 issue of The Aesthetic Guide, a bi-monthly publication in the field of aesthetic medicine with a readership of over 25,000. A E Skin won the 2014 Aesthetic Practice of the Year award at The Aesthetic Show 2014 in Las Vegas, NV. The Aesthetic Awards distinguish doctors for their work in aesthetic medicine and are considered "The Oscars" of the field. The Aesthetic Practice of the Year award recognizes outstanding efforts of a team to build and grow an exceptional aesthetic practice as demonstrated by the work of staff, marketing efforts, patient experience, website design, social media, public relations, community outreach, etc. This award is unique in that it is the only award that is voted on exclusively by patients and seceveral outstanding practices from around the nation were selectively nomitated. A E Skin is honored to receive this award and thanks all of our loyal patients for their support. A E Skin also won the regional Best Aesthetic Practice award at the Aesthetic Academy in Beverly Hills, CA in 2012, as well as Best Medical Spa in Encino for two consecutive years in 2013 and 2014, placing A E Skin in the Hall of Fame. At A E Skin we are very proud of our work and our awards demonstrate how much patients appreciate our service. Contact Us for a free consultation with Dr. Alex.